Chat to anyone with more than a passing interest in urban cycling and it wont be too long before the word "Copenhagen" is uttered. The great Danish capital has come to be seen as one of the best examples of how mass cycling can work in a large metropolitan city. Talk a little longer and the words "Copenhagenize" and "Copenhagen Cycle Chic" will soon be mentioned, too. One man has been responsible for the remarkable success of marketing Copenhagen to the world and showing how other cities can learn from their example; his name is Mikael Colville-Andersen and he is coming to London. The story of how Copenhagen Cycle Chic came about has almost passed in to legend; a keen photographer and urbanist Mikael happened to snap a typical female Copenhagen cyclist waiting at the traffic lights in a pair of high heeled boots. He uploaded the picture to the photo sharing website Flickr and the comments came flooding in; "She rides a bike dressed like THAT? ", "Where is her helmet?! ", "Wow, do women really ride bikes in Denmark?". He'd hit a nerve and the rest, as they say, is history. Fast forward five years and Mikael is a man in demand. He travels the world giving lectures on promoting the bicycle as a simple tool usable by all, and the importance of design and the built environment in creating the correct conditions for mass cycling. 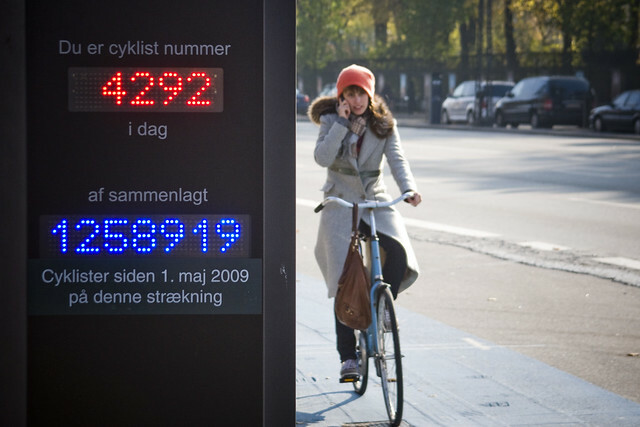 As well as maintaining the Cycle Chic site, he shares how cities can go about building mass cycling rates through his consultancy and sister website "Copenhagenize". And the original "cycle chic" has spawned 100s of copycat blogs showing off the two-wheeled well-heeled citizens of the world, but most importantly and undoubtedly has helped to re-position the humble bicycle not just as the pursuit of people playing sports but an effortless tool for everyday urban mobility. Our good friends at BIKEMINDED - the fantastic bicycle promotional project from the Royal Borough of Kensington and Chelsea - are hosting an evening of all things Danish on Thursday 11th October at the beautiful Chelsea Old Town Hall. There will be Danish food and drink to sample provided by the Royal Embassy of Denmark, and a display of Danish bike manufacturers (if you haven't had a ride on a Velorbis yet, it really is time you gave it a try!) as well as photos of the good cyclists of Copenhagen and their wonderful cycling infrastructure. And to cap off proceedings "Mr Cycle Chic" himself, Mikael will be giving a guest lecture on Copenhagen Cycle Culture which is sure to be unmissable. Best of all places are free (but running out fast!) Full information is on the BIKEMINDED website here and you can register for your place at the evening here. Entry is by ticket only so you'll have to be quick. I was lucky enough to meet Mikael and visit Copenhagen last year. For my write up and photographs "Why can't we Copenhagenize London?" see here. Everyone loves what you guys are up too. Such clever work and exposure! Keep up the great works.Thank you for your sharing.